Can Nail Salon UV Lamps cause Cancer ? Nail salons use high intensity ultra violet lamps in order to dry and cure nail enamel. These lamps emit UVA light which is associated with skin cancer. Does that mean that nail salon UV lamps can cause skin cancer? Most definitely not in one visit but if you repeatedly expose your nails to this light, the chances of skin damage is high and it could perhaps lead to cancer too. What do UV lamps in the salons do? 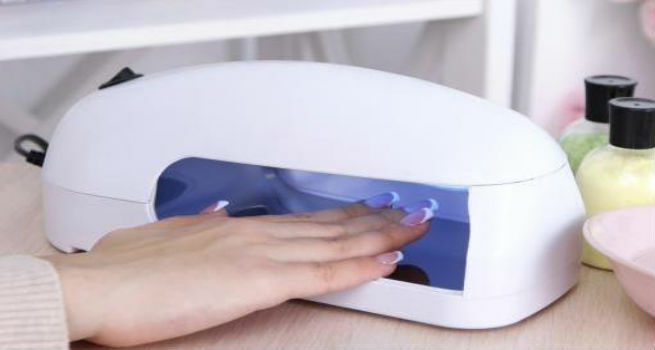 The UV lamps in nail salons act as dryers which quickly dry either the nail enamel or harden the gel manicure and also help them last longer. Normally, after every coating of nail enamel or the gel manicure, the nails are placed under these lamps so that they can dry and harden faster. The light that comes out of these UV lamps is UVA light. Why is UVA light harmful? The component of sunlight that is attributed to causing skin cancer is UVA light. The powerful radiation is capable of causing melanoma, damage to the DNA and skin aging upon prolonged exposure. Do all UV lamps cause damage? The wattage of the light used in the nail salon differs from place to place. If the wattage of the lamp is high, then the level of UV-A radiation in the light is also high. Lower level of radiation does not pose as much risk and would need hundreds of visits before it can cause any damage to you. If the lamp is of a high wattage, then you run the risk of the UVA radiation causing lasting damage to the cells in your body. Again, a single visit is completely safe since the danger of cancer occurs only upon cumulative exposure. Does this mean saying no to UV Lamps? Prolonged exposure to high intensity UVA rays, occurring from multiple visits in a month can cause basal cell carcinoma. A study has shown that depending on the intensity of the rays, it could take anywhere between eight to 200 minutes under the UV lamp in order to cause damage to the cells and pose the risk of cancer. If you occasionally visit the nail salon, then there is no cause for concern. A single sitting will expose you to about 5 minutes of tolerable intensity of UV light which is not going to do any harm to you. Moreover, most of the studies are in the preliminary stages and do not have any solid proof to link exposure to nail salon UV lamps and skin cancer. This does not mean you do not take the threat seriously since you cannot rule out the possibility either. If you are worried about the UV lamps in nail salons causing cancer, then the best thing for you to do is to use a broad spectrum sunscreen on your fingers before you stick them under the lamp. Restrict exposure to once a month. Better still, air dry your nails to stay away from any kind of fear of cancer risk.